Following my last post about 2008 Forrester Research survey and how corporate blogs are not trusted to get information on the web, I’ve been reading marketers’ ideas of how blogging can help manage corporate image without too much investment in time of financial stress. this is why there is so much momentum for investment in a Corporate Blogging Strategy. Both B2B as well as Retail Marketers are learning that it’s content that drives search results and prospect engagement. Whoever has more content thats both recent and frequently updated wins. Blocking and Tackling simply means empowering your employees to talk about what they are doing…the products, the customers, the service….as Cramer said: « You talk about your day ». It [Business blogging]’s highly efficient because the blog content is frequent and free. The ROI is easily measurable when compared to pay per click or any of your other traffic generating strategies. 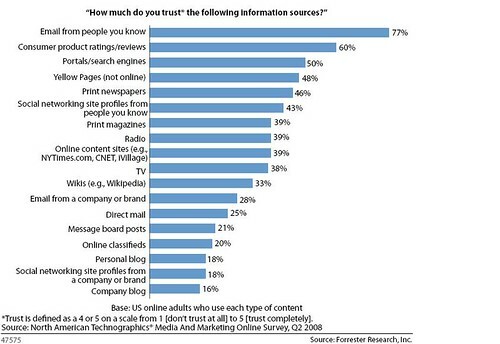 According to a 2008 Forrester Research Inc. survey, people don’t trust corporate blogs to get trustworthy information. The « people I know » or « friends’ friends » network is perceived as being able to deliver quality (credible) news about an organization in the contrary of a business blog. Josh Catone also specifies that a corporate blog should target customers’ needs (or employees’ needs in the case of an internal blog) and not just the management’s concerns. Besides, corporate blogging should also be part of the corporate culture and everyone should be encouraged to blog in the organization. The type of content which is then published can be a good (and true) reflection of the company’s life and values… and as such, generate a real conversation with its stakeholders. As a follow-up of my previous post about measuring benefits of corporate blogging for an organization, here is a presentation by Giacomo Manson and Pier Luca Santoro (Italian consultants – slideshare presentation in Italian for those of you who feel comfortable enough with Dante’s language) which tries to identify and measure benefits of internal blogs. This very valuable presentation is quite comprehensive in my opinion in the way it lists costs and benefits of an internal corporate blog. Moreover, by giving tools to measure the efficiency of such a communication channel, it helps communicators promote blogging as a real part of business life… not just a geek’s addiction. Today’s article was found on CIO Today website and is dealing with Corporate blogging in a Chief Information Officer’s perspective. One important concern for an organization willing to set up a corporate blog is to see where the benefits are. In this article, the author questions issues like productivity of employees reading and posting on the blog, visibility of the organization through such media and potential problems of adjusting a blog to the general communication concept. Yesterday, I was listening to a radio show dedicated to Science called « Impatience » on the Swiss national broadcast (rsr.ch). They invited a French philosopher called Michel Puech to talk about his new book « Homo sapiens technologicus » which deals with the integration of technology in human societies and related changes or challenges for the future. On part of the interview was dealing with the fact that our society had chosen technology over Science… This has the following consequence that technology leads to Efficiency while Science is pursuing Truth. One thing is sure nowadays, among professionals communicators and marketers : efficiency is the master word… but what about truth ? This maybe interesting to question that option for the near future, isn’t it? Antonio Lupetti, engineer and pro blogger, wrote very comprehensive information about webdesign and programming on his blog and organized it in a freely downloadable book on scribd plateform. As Antonio Lupetti puts it, it’s a collaborative experience in the way that this book is a result of comments and reactions to his blog posts about webdesign and programming on the web. It certainly enhanced the content of this book and the result is quite useful (and free) ! Social media is alive and kicking! As Simple Minds put it, social media is alive and kicking. On Techcrunch, Erick Schonfeld‘s comment on ComScore worldwide traffic stats from Sept. 2007 to Nov. 2008 is giving a good idea of social media’s rise. If Facebook’s number of total unique visitors is always on the rise (not really surprising…), blogging plateforms like wordpress and Blogger are doing well. But more relevant in my opinion is the persistent presence of websites like Flickr, MySpace or Scribd (see Scribd stats for 2007-2008) in this top 20. Indeed, more people throughout the world are willing to share documents, pictures, videos, presentations (slideshare…) freely online, the web becoming a giant collaborative wiki.